Create your own catalogs of objects. Manage your collection and objects to sell, to buy, to exchange. Get a summary and cost estimation of your collection. Import and export your catalogs as an Excel file. Publish your catalogs on MBC Cloud. Share your objects on social networks. Search for objects by keyword. Premium license allows you to create the number of objects you want. Without license, a maximum of 25 objects can be created. Select "Activate PREMIUM version" in the main screen and you will open Google Play to do your purchase. This license is linked to your E-Mail. It is valid on all smartphones or tablets using the same E-Mail. If an internet connection is available then you can select download and install a catalog. Take care, some catalogs needs a PREMIUM license to be downloadable. Catalogs you can download without PREMIUM license. Catalogs you can download with PREMIUM license. Remove a catalog you have publish on MBC Cloud. You can access to all objects of a catalog by selecting first a catalog then a category then an object. - When you are in the list of objects, this button allows you to create a new object. Catalogs, categories and objects of official catalogs cannot be modified, moved or removed. When you create or modify a catalog, you can modify its name, unit, type and visibility of each of the 10 parameters defining an object. This is the way for you to adapt this application to your own type of collection..
Checkboxes allow you to define if a parameter is visible or not in the list of objects. Remark : PRICE type cannot be modified to TEXT or NUMBER. You can add your own pictures of objects. A maximum of 5 pictures per object is possible. Switch to picture management mode. Add a picture selected on your SD-Card. Add a picture from clouds. Add a picture from your camera. Modify a picture : Zoom in/out, move, rotate a picture. Remove current picture. You can only remove your own pictures. You cannot remove offical picture. Export a catalog and its collection. Publish it on MBC Cloud. 1 - Export your catalog as an Excel file using the contextual menu of a catalog. Once your catalog is exported as an Excel file, you can also publish it on MBC Cloud. It allows you to see this catalog into the list of downloadable catalogs. Thanks to this feature, you can easily share a catalog between 2 Smartphones or Tablets. Go to your list of catalogs. Using the contextual menu, select "Export Excel / Publish". - Your catalog and its collection are exported into an excel file. - An Excel file is created in the "Download" folder of your Smartphone. A zip file using the same name is also created. It contains all pictures associated to all objects of your catalog. - If you want to import this catalog, the Excel file and zip file must be in the same folder. If not, pictures won't be imported. Select the button "Publish on MBC Cloud"
Once upload is done, go to the main screen and select the button "Download". Your catalog is available in the list. Nobody else than you can see this catalog. 1 - Open the left tool bar and select "Import Excel"
Display the collection as a graph. Display the collection as a list. To be able to manage your collection, you must first select a catalog and a category. Then you are in the list of objects of a category. Switch to collection management using this button in the toolbar on top of the screen. In the bottom bar, select wich list you want to change : Collection, objects to sell, objects to buy, objects to exchange. Check the objects you want to change. Switch to collection management mode. Select all objects of the current category. Update the list "To sell" : It means all objects you have twice in your collection will be moved into your list of objects to sell. Update the list "To buy" : It means all objects you have not in your collection will be added into your list of objects to buy. Define wich function you want to access from home screen. Define your MC-Collections id. This E-Mail is your id when you share your collection. Display RSS feeds and also frequent Questions/Answers. 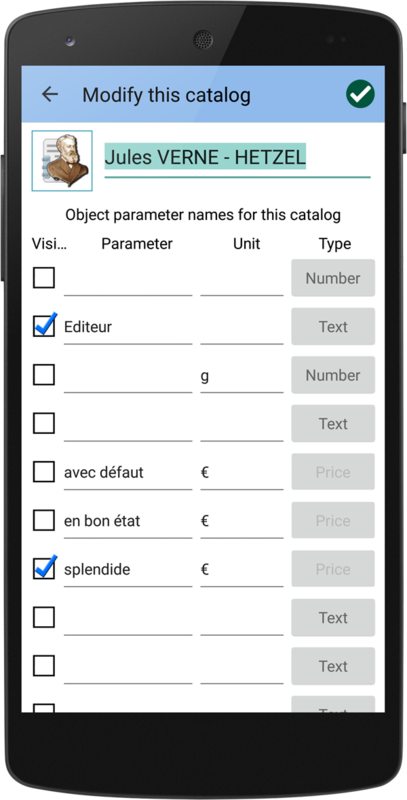 Create a summary of your collection, objects to buy, objects to sell, objects to exchange. Calculate a cost estimation. Import your catalog as an Excel file. All of your catalogs can be exported as an Excel file. Define which SD-Card will be used to save all pictures of objects. If your device has an external SD-Card, you can use this SD-Card to save all pictures of objects instead of your internal memory. Open the left toolbar and select "Change the folder for objects pictures". If your device has an external SD-Card then you can select this SD-Card. Validate your choice and all pictures will be moved to the selected SD-Card. It can take a very long time to move all pictures. It depends of your device and the number of pictures. Your selected SD-Card is now validated. If you download a new catalog, it will be installed in this new folder. 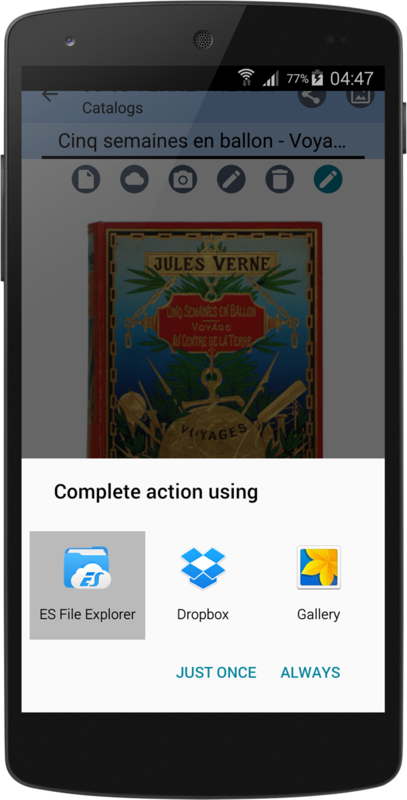 Allows you to share a object with your friends using one of the application available on your smartphone or tablet. For example, you can send a object and its full description by E-Mail. Add, modify or remove personal notes. Validate the new personal note. Create a new personal note. You can search for a object in all catalogs or categories. Fill-in a keyword and you'll get the list of objects using this word in one of object's parameters. Personal notes are also taken into account for this research.